The brides are in town and the wedding season has begun. At the Atelier Pronovias 2016 bridal fashion show, Irina Shayk is the ethereal beauty who rocks the runway stage with her provocative saunter, her incredible grace and her gentle smile, looking like the sexiest angle around with her translucent lacy sheath gown. 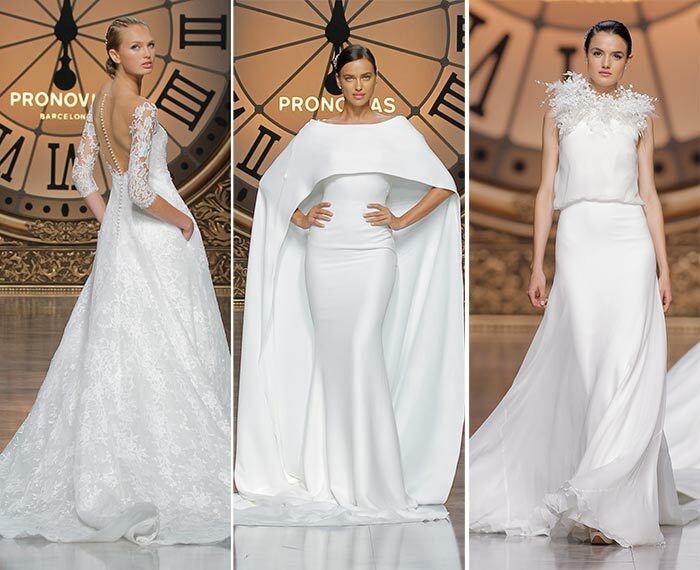 However, while the brides for this year have already chosen their gowns and ticked off most of the items from their “to do’ lists, this particular collection is meant for next year, in 2016. 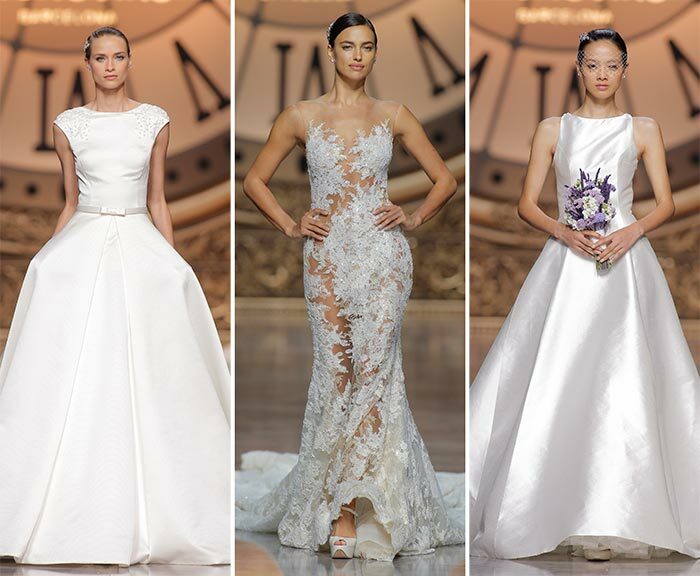 The Spanish bridal label brought to light an incredible line-up that seems to have been “Once Upon a Time’ inspired and a spinoff from the fairy tales of our youth. With crystal gems, organza tulle and lace embroidery featured on the pieces, it is but heaven itself that has opened the doors and thrown before us some of the most exquisite creatures with the most alluring gowns about. Every woman wants to feel like a princess on her wedding day. We are born for that, trained from childhood to become the bride, and when it comes to picking the perfect bridal dress that not only makes us look like royalty but feel like one too, Pronovias is the perfect label to turn to. Like frosted snowflakes growing across her body, Irina Shayk shows off her curves to the world, encased in a form fitting dress with transparent tulle at the shoulders and a curving line down the body, showing off the center of the chest, one side of the hips, single thighs and legs, the train of her gown extending far behind her and sweeping the floors with rippling ease, as if the model herself has risen from the frothy ocean like the goddess Aphrodite herself. Add gorgeous peep-toe platform heels with ankle straps to the mix and the tall model adds quite a bit of height to her stature, elongating already long legs. Shayk truly appears to be heavenly royalty in this particular Pronovias dress. Glittering embellishments add such a lovely touch to another of the Pronovias bridal 2016 collection, wherein it appears as if vines of white flowers encase the body of a beautiful princess, growing over her shoulders and down her legs to her knees, before the froth of the beautiful organza tulle creates that mermaid look, the body hugging design giving way to a voluminous end. It is like a cloud of fog surrounds the lower parts of the legs and the train itself appears to meld in with the white flooring. The lace underneath the tulle peeks through and looks rather out of place actually, like a dress peeking through the fog itself but us not being able to see the full silhouette. This is an interesting look and quite lovely to say the least. The clock strikes twelve in the background and our Cinderella strikes a pose before it, though she seems to be in no hurry to run away. This is the mature queen we are seeing here, the lady who understands the seductive nature of her curves and shows them off in a more conventional manner, covered in bridal satin, her train long behind her, her shoulders covered in a dramatic cape attachment. She looks to be the star of the show and who are we to deny her that role at Pronovias?